Low temperature solar thermal technologies, especially those that do not generate electricity, rely on the scientific principles behind the Greenhouse Effect to generate heat. Electromagnetic radiation from the sun, including visible and infrared wavelengths, penetrates into the collector that is absorbed by the surfaces inside the collector. Once the radiation is absorbed by the surfaces within the collector, the temperature rises. This increase in temperature can be used to heat water. 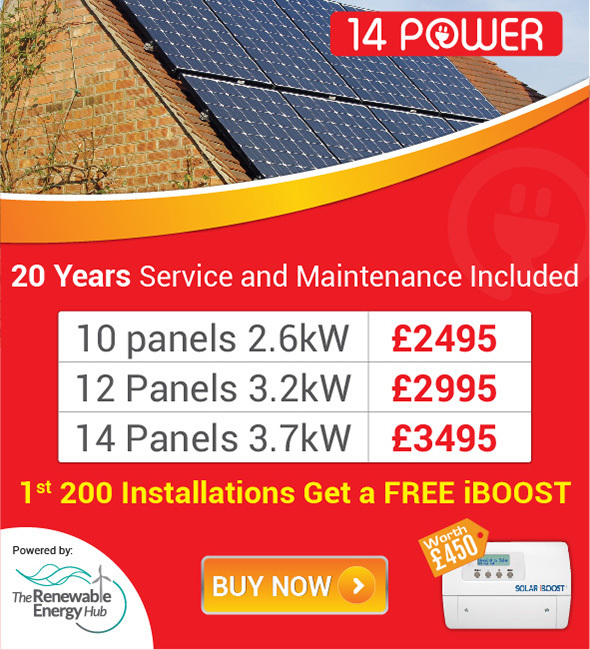 Solar Water Heating (SWH) is an effective method of utilising available energy sources to perform useful work. The energy from the sun can provide hot water for many domestic and industrial applications, displacing the need to burn fossil fuels. In Australia, around 25% of domestic energy consumption is devoted to the heating of water to low temperatures, of less than 100oC. Two main components of SWH systems are collectors and storage tanks. There are many different types of configurations and collectors. The most commonly used type of collector is the flat plate. These collectors consist of airtight boxes with a glass, or other transparent materia,l cover. 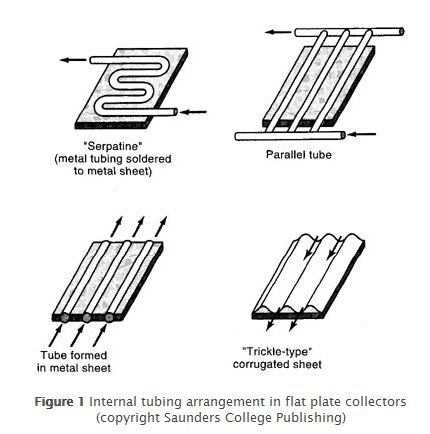 There are several designs on the arrangement of the internal tubing of flat plate collectors as shown in Figure 1. Traditional collectors, like the Serpatine and Parallel tube examples above, consist of a number of copper tubes, known as risers that are orientated vertically with respect to the collector and placed in thermal contact with a black coloured, metal absorbing plate. The use of selective surfaces on absorbers improves the efficiency of solar water heaters significantly due to a very high absorbance (percentage of incoming energy that a material can absorb) and low emittance (percentage of energy that a material radiates away) of electromagnetic radiation. At the top and bottom of the metal absorbing plate, thicker copper pipes, known as headers, assist in the removal of heated water and the arrival of colder water to be heated. Insulation is placed between the absorbing plate and the external wall to prevent heat losses. Whilst the principles of operation for flat plate collectors are fairly consistent, significant improvements in the design of systems, particularly absorber plates have occurred. Flooded plate collectors are similar to their tubed cousins, except that two metal absorbing plates are sandwiched together, allowing the water to flow through the whole plate. The increased thermal contact results in significant improvements in the efficiency of the system. In recent years, much research has been conducted on selective surfaces, which has seen significant improvements in the efficiency of solar water heaters. Today, a majority of absorber plates are composed of solar selective surfaces, made of materials that strongly absorb electromagnetic radiation (i.e. sunlight) but only weakly emit. Batch water heaters, also known as ‘breadboxes’ are very simple passive systems for heating water using solar energy and have been used since the early 1900s. Batch systems consist of black storage tanks contained within an insulated box that has a transparent cover. Cold water is added to the hot water stored in the tanks whenever hot water is removed. Modern batch systems are used as preheating systems, where the water is then heated further by conventional gas, electric or wood systems. To retain the heat within the water, the system requires insulated covering to be placed over the glazing at night to prevent the heat being lost to the environment. 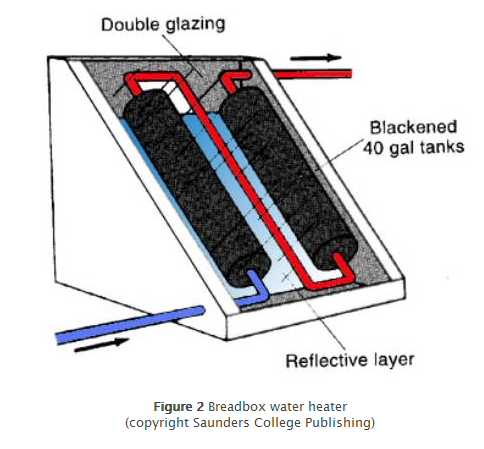 Figure 2 shows a typical Breadbox water heater. According to Planck’s Law, the wavelength of radiation emitted from a surface is proportional to the temperature of the surface. Therefore, an ideal selective surface (the dark coloured material that lines the inside of the collector) for solar collectors should strongly absorb electromagnetic radiation (light) in the visible range and only weakly emit radiation back in the infrared range of the spectrum, so that the maximum amount of energy from the incoming sunlight is used to heat water. Chemical coatings are usually sprayed onto the absorber plate metal, with or without the use of electricity. These coatings do not alter the re-radiative properties of the plate metal, only enhance the absorption of the solar radiation. The thickness of the chemical coating is proportional to the selectivity of the surface. That is, the coating thickness influences not only the absorptivity of the surface, but also the emissivity (how easily the surface emits the longer wavelength IR radiation). Despite the low relative cost and ease of application, chemical coatings are often undesirable because of the temperatures reached inside collectors, which can cause a degradation in the chemical coatings. For example, black paint applied to the plate is considered to be a chemical coating. At high temperatures, the paint is likely to melt or burn off the surface, releasing volatile organic compounds into the environment. Electroplated coatings are the most widely used coatings in the solar collector industry. These coatings are applied to the absorber plate metal using traditional electroplating technology. Prolonged exposure to elevated temperatures (around 200oC) and humidity can cause slow degradation in the selective coating as oxidation and crystal lattice reconstruction occurs. Black Chrome, a common electroplated coating used in the manufacture of solar collectors is relatively stable, particularly in humid, tropical conditions. Vapour deposited coatings are not traditionally used in flat plate collectors, as there are a number of significant engineering problems which are yet to be overcome. However, they are used extensively in evacuated collectors, which utilise a partial vacuum, such as the receivers in high temperature solar thermal systems. Oxide coatings were the first type of coating used in solar collectors. Metals used in early solar collectors, such as copper and iron underwent natural oxidation, which have desirable absorptivity. However, as the oxidation processes occur naturally, they are difficult to control, which results in a change in the emissivity of the material and eventual degradation of the efficiency of the collector. The evacuated tube solar thermal system is one of the most popular solar thermal systems in operation. An evacuated solar system is the most efficient and a common means of solar thermal energy generation with a rate of efficiency of 70 per cent. As an example, if the collector generates 3000 kilowatt hours of energy in a year then 2100 kilowatt hours would be utilised in the system for heating water. The rate of efficiency is achieved because of the way in which the evacuated tube systems are constructed, meaning they have excellent insulation and are virtually unaffected by air temperatures. The collector itself is made up of rows of insulated glass tubes that contain copper pipes at their core. Water is heated in the collector and is then sent through the pipes to the water tank. This type of collector is the most efficient, but also the most expensive. Depending on the water supply system, the system can be either a closed-coupled system or a gravity fed system. The most common tank in solar hot water systems is the close-coupled system, where the storage tanks are mounted with the collector on the roof. Tanks are located above the collectors to take advantage of thermosiphoning. Thermosiphoning utilises flat plate collectors to heat the water, which returns to the storage tank, located above the collector. Cold, denser water flows through the collector heating up and is then returned to the tank. As the heated water is less dense, it rises to the top of the tank. For thermosiphoning to be successful, it is essential that a constant rise in the pipe work is maintained and that the correct diameter pipes are used as risers and headers. In full sun a single pass through the collector can heat the water by as much as 20oC. Roof mounted flat plate collectors that utilise thermosiphoning are extremely popular in the Middle East, with 70% of the population using water heated by these systems. 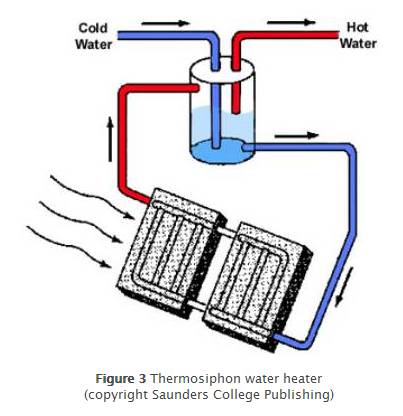 Figure 3 shows a typical thermosiphon water heater. The density of water changes with respect to temperature. Generally, water is less dense at higher temperatures than at lower temperatures. Thermosiphoning uses this principle to circulate water through the collector, as cooler water from the mains will be drawn through the collector as the heated water is removed from the storage tanks. Two significant advantages exist with the close coupled system: this arrangement is the most cost effective system for installation and heated water is provided at mains pressure. In gravity fed systems, the tank is installed in the roof cavity, with only the collector exposed to the sun. Positioning of the solar collectors must allow natural thermosiphoning to occur. Whilst these systems are usually the cheapest to purchase, household plumbing must be suitable for gravity feeding, i.e. larger pipes in the ceiling and down to the taps. In forced circulation systems a mains pressure tank is located at ground level with the collector on the roof. In these systems, a pump is activated when the sun shines and cold water is pushed through the collector. Forced circulation systems are more expensive to purchase than either the close coupled or gravity feed systems, and electricity is required to provide power for the circulating pump.